Whether you call them dish gardens, fairy gardens, or just plain terrariums, tabletop ecosystems are making a comeback. Today’s versions are more varied than the fishbowls you (or your mom) hung in macrame back in the 1970s. For example, Restoration Hardware’s holiday catalog includes a terrarium kit in a Mason jar with a tiny plastic deer. More serious gardeners are incorporating sculptural plants like succulents or bonsai to turn mini-landscapes into works of art. Terrariums have become a signature item at Garden, a boutique plant store in Atlanta’s Westside that feels like an enchanted forest of lush tillandsia, philodendron, and orchids. Owner Matthew Klyn, whose creative outdoor landscapes first earned him notice with Best of Show at Atlanta’s Southeastern Flower Show in 2006, started focusing more on indoor gardening and retail plants when he opened his shop two years ago. Klyn fills glass vessels with mosses, ferns, and orchids as an alternative to a full-scale garden. 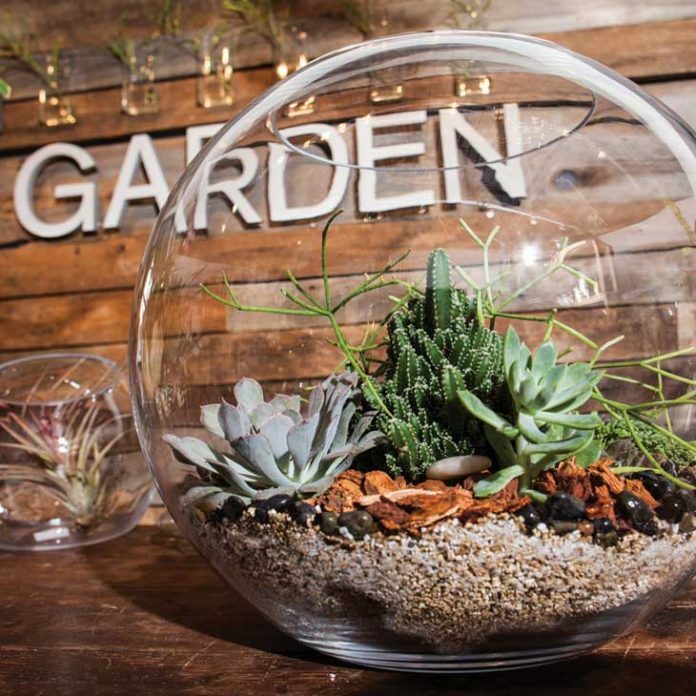 “Not everyone can afford a $5,000 garden,” he says, referring to his residential design work, “but they can afford a terrarium.” Priced from $37.50 to $400, Klyn’s one-of-a-kind creations now account for about a third of his business. To make one yourself, fill the bottom of a glass vessel with layers of vermiculite, rocks, and charcoal (which help drainage and air filtration). Poke in some small, richly textured plants, such as mosses, orchids, and episcia, and cover loosely with a lid. Condensation will bead up on the inside of the glass, making the landscape virtually self-sufficient. Succulents, on the other hand, require open-air containers and regular watering. This article originally appeared in our December 2012 issue. Create your own lush landscape—with the click of a button. Fred! Lawn Design Company is digitizing landscaping.